Nightshade is a plant commonly found growing in graveyards. While it grows around death, it still needs light, preventing it from growing inside most crypts and barrows. 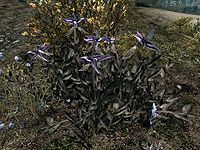 "The name and shape of this plant are known to all; long understood to be one of the more potent components in many poisons, the average Nord keeps his distance from the bright purple flowers nestled among dark leaves. It is exceedingly effective as a pure poison, but can also be combined with other compounds to stiffen joints as well. It is thus favored amongst those who wish to disable their opponents in battle, and can be found coating the blades of many of the more unsavory characters in Skyrim." - Agneta Falia in the Herbalist's Guide to Skyrim. This page was last modified on 5 February 2019, at 21:45.